Rocky Schenk, "OH," 2016, hand tinted archival pigment print, 42 x 52"
The world documented through the lens of photographer Rocky Schenck feels familiar to the eye of an Angeleno. It probably exists as a dream to those looking from a distance. Interestingly, the artist resists clearly identifying the locations in the photographs that comprise “The Recurring Dream.” The technique that Schenck employs embraces an early tradition of photography, whereby film prints are individually dipped in oil paint. The results are large, hand-tinted archival pigment prints that quite literally blur the edges to merge architecture and people into a single frame. The grain inherent to the film becomes exaggerated when mixed with oil paint, making each photograph a glimpse into a surreal landscape characterized by light and ambition, but lurking behind the shadows are tales of sadness and emptiness. A native of Texas, Schenck moved to Los Angeles to begin a career writing and directing short experimental films and music videos. His personal journey from the rich landscapes of the great American West to the frontier of Los Angeles speaks to the spirit of exploration felt in his photographs and artistic process. For Schenck, Los Angeles remains a freshly discovered land filled with grandeur, complexity and unexpected beauty. Captured in the late evening hours, “Gas Station” depicts the iconic Mid-Century Modern 76 Gas Station on the corner of Crescent Drive and Little Santa Monica. Designed by Gin Wong, the lines of the iconic structure that resemble a spaceship more than a gas station are obscured by the damp dark night and the harsh fluorescent bulbs reflecting from the sidewalk. There are no cars, only a single man who appears like a shadow despite the high voltage of light that surrounds him. There is a sense of emptiness in the photograph that suggests despite the shining lights darkness lurks in the city. Captured from a vantage point high above the Hollywood Hills, “OH” looks down on the vast expanse of the metropolis. Standing from behind the Hollywood sign, Schenck exposes the graffiti of past visitors who wished to leave their mark on the famous sign symbolizing the promise that our City of Angels is built on. Beyond the stray dandelions, a vague terrain winds along the hills below. The skyline is polluted by a veil of haze, yet its outline remains distinctive and the flora and fauna that weave in between roads and homes bask in a golden glimmer. The landscape is devoid of any people or cars. It's a romantic portrait of light that shines like an open field in the countryside. 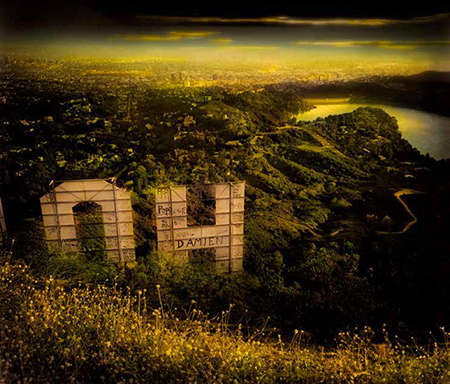 By capturing the first two letters of “Hollywood” and then inverting him, it’s as if the artist is reminding us that Los Angeles is still filled with surprises.